As the weather begins to turn crisp and fresh, pinching cheeks and tugging hair out of hats, so we turn our thoughts more than ever to the fireside. Cozy afternoons snuggled up with a huge pile of books is one of my most treasured treats of the colder months. Though we’re not quite in hibernation season yet I love to plan a booklist that will return us to old favorites and introduce some new friends. 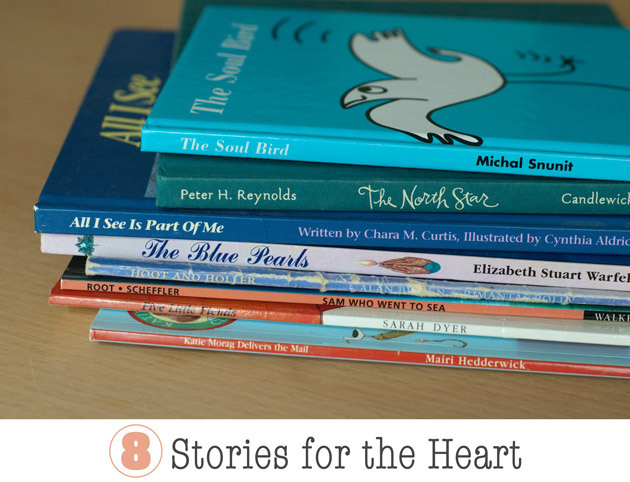 The list of wonderful children’s books is endless, there are more than it is possible to name, but I want to narrow down my list to a few that I feel speak more to the child’s heart than their head. I’ve chosen a few books that I reach for when I want to explore some of the more complex moments that might rear up in a child’s life and that offer a little guidance and encouragement when things don’t always go as planned. 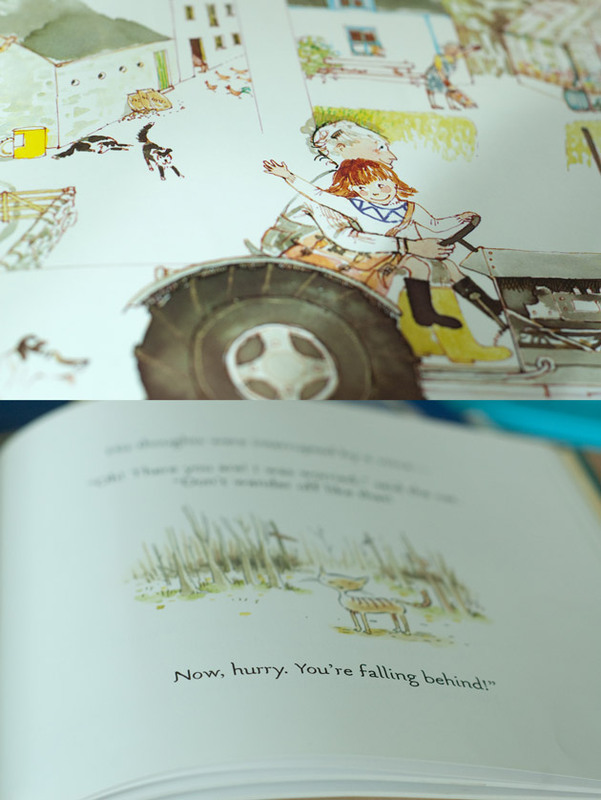 Friendship – Hoot and Holler – This is one of my all time favorite picture books. It is beautifully drawn and is perfect for the autumnal season featuring as it does two lovely owls. The story explores what it means to be a friend, how to trust your heart and to never be afraid to express love. I adore everything about it. 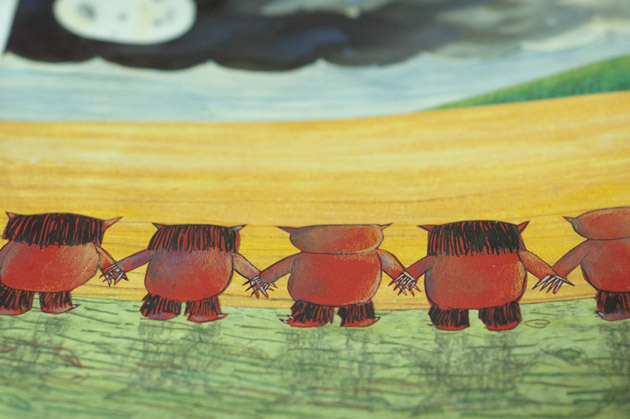 Sharing and Consideration – Five Little Fiends – This unusual book takes us into a more mythical landscape occupied by the five little fiends, each one of which takes an element of the world away with them so that only they can enjoy it. Of course they quickly realize the interconnectedness of all the world’s wonders and are finally able to appreciate it together. Dream the Dream – Sam Who Went to Sea – This is an uplifting story of a river rat who dreams of the wide ocean. Despite the lack of encouragement he experiences by those around him he builds his boat and finally achieves his dream. The thing I like most about this book is that his friends and neighbors never really understand his passion for the sea but he finds peace and satisfaction none the less. Making Mistakes – Katie Morag Delivers the Mail – This is one of a series of books set on the remote Isle of Struay off the coast of Scotland. In this book Katie makes a mistake when she is delivering parcels and gets them all mixed up. With the help of her grandmother she is able to sort it all out and return home happy. The simple but vividly accurate depictions of home life, the significant power of a mistake in a child’s life and the importance of honesty and courage in resolving matters, is beautifully rendered in this soothing story. A lovely fireside read. Life’s Journey – The North Star – In this extraordinary and very moving allegory a little boy makes his way along a path, trying to find his way. He gets lost in the woods, misdirected and confused and must eventually find his way back to his true course. It is clear that what is right for him, isn’t right for everyone and vice versa, but this story reinforces that we must choose our own path and stick to it, no matter the outside pressures. A great story for a child dealing with peer pressure at a young age. Spirituality – All I See Is Part Of Me and Soul Bird – Both these books help to answer some of the questions even very young children can have about their place in the world and what it means to be alive. All I See Is Part Of Me explores the connections between all things and stresses the light that is within us all. Soul Bird is suitable for older children (8+) and examines the true essence of a person and how our inner self can affect our outer actions. A great resource to help children make the connection between inner pain and behavior. 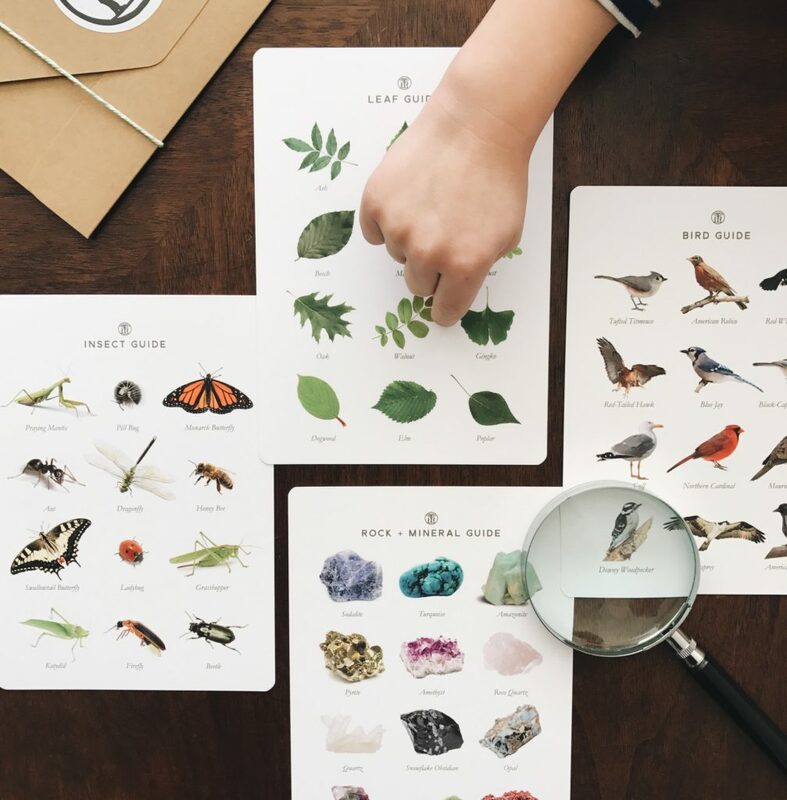 Grief – The Blue Pearls – Finding a vocabulary to discuss loss and grief with children can be incredibly difficult and yet couldn’t be more crucial. 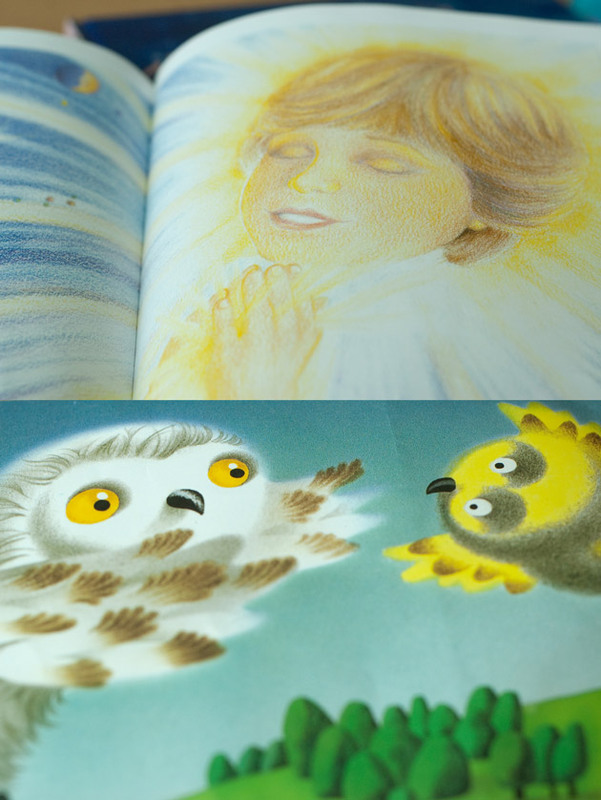 This book tells the story of angels who are preparing to welcome a little girl to heaven. This book was a gift to me when my mother died and is a wonderful resource for explaining death to a child while emphasizing the unending nature of life. I would caution you to read it alone first though as tears are inevitable! The common thread that runs through all of these wonderful books is that none of us is alone in our struggles through life. Other people have made mistakes, lost friends, asked questions about existence and felt deep sadness. To know that these experiences are not unique, that they are part of being human and can be resolved and overcome, is a wonderful gift. In the end all of us, whether adult or child, old or young, simply want to know that even when our hearts are filled with sadness, we are not alone.